Arthrex’s Global Headquarters is located in Southwest Florida. 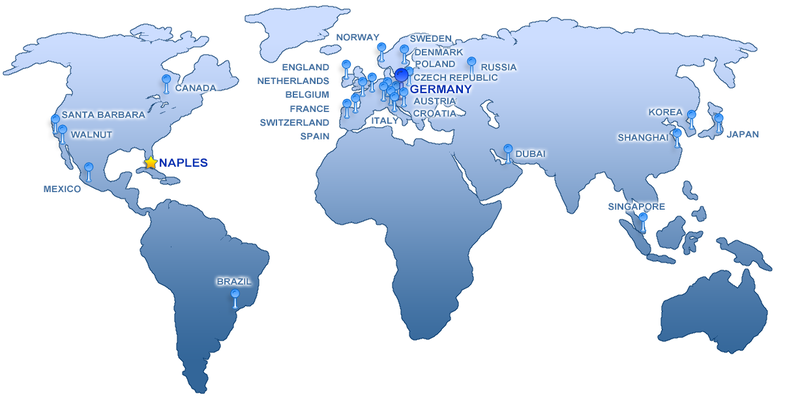 Additional locations include Regional Head Offices in Munich, Germany (EMEA) and Singapore (APAC) as well as several subsidiaries and distribution centers throughout the Eastern and Western Hemispheres. Asia Pacific (APAC): Arthrex Japan G.K., Arthrex Korea and Arthrex Shanghai Co., Ltd.
Europe - Middle East - Africa (EMEA): Arthrex GmbH, Arthrex Adria d.o.o., Arthrex Austria GesmbH, Arthrex BvbA, Arthrex Danmark A/S, Arthrex España & Portugal, Arthrex Ltd., Arthrex Italia S.R.L., Arthrex Nederland B.V., Arthrex Norway AS, Arthrex Polska SP. z.o.o., Arthrex France, Arthrex s.r.o., Arthrex Sverige AB and Arthrex Swiss AG. Latin America: Arthrex do Brazil, Arthrex México, S.A. de C.V.
Western Hemisphere: Arthrex California, Inc., Arthrex California Technology and Arthrex Manufacturing, Inc.
Arthrex España & Portugal S.L.U. Arthrex México, S.A. de C.V.
Argentina, Australia, Azerbaijan, Bahrain, Barbados, Bolivia, Bulgaria, Canada, Chile, Colombia, Costa Rica, Cyprus, Czech Republic, Dominican Republic, Ecuador, Egypt, El Salvador, Estonia, Finland, Greece, Guatemala, Guyana, Honduras, Hong Kong, Hungary, Iceland, India, Indonesia, Iran, Ireland, Israel, Jamaica, Jordan, Kazakhstan, Kuwait, Libya, Lithuania, Malaysia, Malta, Mauritius, New Zealand, Pakistan, Palestinian Territories, Panama, Peru, Philippines, Portugal, Puerto Rico, Qatar, Romania, Saudi Arabia, Singapore, Slovakia, South Africa, Surinam, Taiwan, Thailand, Trinidad and Tobago, Turkey, Ukraine, United Arab Emirates, Uruguay, US Virgin Islands, Venezuela, Vietnam.